“SMARTER: HOW TO EDUCATE FOR THE ECONOMY” - WSSE "INVEST-PARK". Wałbrzyska Specjalna Strefa Ekonomiczna "INVEST-PARK". Companies functioning within the Wałbrzych Special Economic Zone “INVEST-PARK” are declaring a willingness to employ at least six thousand specialists in the next few years. Representatives of the following professions will be in particularly high demand: sprayers, mechanics, electrical mechanics, machine operators, welders, sewing technicians, fitters, electronic engineers and electricians. In order to secure employees for the existing and potential investors, the Wałbrzych zone is involved in actions supporting vocational education within the “INVEST in EDU” Educational Cluster. During the conference “Smarter: How to educate for the economy”, which was held in Bolków on 12 June, another 30 partners joined the project. During the meeting, the best entrepreneurs, schools, students and teachers received awards. Moreover, the agreement “The S3 – The Road of Great Opportunities” was signed. The main aims of the Educational Cluster include forecasting the demand for concrete jobs in the labor market, adapting the curricula to the needs of the economy and local entrepreneurs, and broadening access to practical vocational training. Thanks to the cooperation of entrepreneurs and schools, vocational training will be more up-to-date and efficient. “We do not just insist on generating more jobs. We want companies to employ top-class specialists, offer them good conditions, great salaries and prospects of development,” said Ilona Antoniszyn-Klik, Deputy Minister of Economy. “Our aim is to attract high-tech companies, and to create favorable tax and logistic conditions for entrepreneurs. This is what we are doing. We expect the companies to support the tasks that we consider most urgent, such as changing vocational education. The entrepreneurs’ reaction has been very positive,” Mrs. Antoniszyn-Klik added. There are 175 firms currently functioning within the Wałbrzych Special Economic Zone “INVEST-PARK”, employing more than 40,000 people. Many of them are announcing new recruitment. The zone is also attracting new investors. Last year, a record number of 65 permits was issued, and since the beginning of this year – another 11. Finding employees with the right qualifications is becoming increasingly more difficult. For this reason, entrepreneurs are willing to get involved in training apprentices. “Companies have the newest technologies, and schools will never be able to match them in this respect. But they do not need to. It is thanks to dual education that students can learn the right skills using real machines during the practical part of the training in companies. This way the entrepreneurs will secure their access to well-qualified staff,” explains Barbara Kaśnikowska, President of the WSEZ “INVEST-PARK”. For more than ten years, Toyota Motor Manufacturing Poland has been cooperating with School Complex no. 5 in Wałbrzych, to the benefit of both sides. “We are consulted in preparing the curriculum. During the practical classes, the students can use real machines under supervision and thus learn what work looks like not only in simulators. It is also important to get to know the company and the rules in it. We would like our employees not only to follow orders but also to suggest improvements, in keeping with the Japanese Kaizen philosophy,” emphasizes Piotr Greszta, Managing Director of Toyota Motor Manufacturing Poland in Wałbrzych. In order to facilitate cooperation between schools and firms, the “INVEST in EDU” Educational Cluster was set up by the Wałbrzych zone in February. Initially numbering 46 entities, it came to include another 30 during the conference in Bolków. The first tangible results of its functioning are already visible. Enrollment for two company-sponsored classes, which will be launched in the new school year, has already begun. The classes will be supervised by two companies from the zone: Segepo-Refa from Świebodzice (in School Complex no. 5 in Wałbrzych) and GKN Driveline (Upper-Secondary School Complex in Oleśnica). Both firms will sponsor about 15-person classes preparing the students to become cutting tool operators. The company-sponsored classes will increase the availability of job training and apprenticeships, and eventually lead to employing the graduates. Apart from being reimbursed for the purchase of course books and protective clothing, the trainees will also have an opportunity of undergoing paid summer apprenticeships. “I believe that the Cluster will act as a cooperation platform for many entities, and there are already almost 80 of them. It will contribute to the development of dual education system and make vocational schools, especially technical ones, schools of first choice,” explains Piotr Krzywda, Head of School Complex no. 5 in Wałbrzych and Chairman of the Cluster. There are numerous examples of good practices in the cooperation of the WSEZ entrepreneurs and schools. Apart from company-sponsored classes, they include job training, apprenticeships, participating by companies in equipping school workshops, or organizing tours to learn about particular jobs. During the conference, the best entrepreneurs, educational institutions, teachers and students received awards from the Minister of Economy and the WSEZ. The following companies were presented with statuettes: GKN Driveline, Zakład Produkcji Automatyki Sieciowej, Mahle Polska, Robert Bosch, Gestamp Polska, and 3M Wrocław. “We are proud to have received the Minister of Economy’s award. 3M employs more than 2,500 people in Poland. We count on the young people in particular. We clearly understand the need to cooperate with schools and universities in order to have the best candidates to work. Each year, we offer paid internships to several dozen people, and we want them to receive real, practical knowledge. It is hard for me to imagine an educational model that would be as efficient as dual education,” said Grażyna Kelly of 3M Poland. The venue of the “Smarter: How to educate for the economy” conference was not accidental. The WSEZ is currently trying to include areas near Bolków in its territory. The construction of Expressway S3 from Legnica to Bolków is about to begin, followed by a new road from Bolków to Lubawka. It will result in making these areas considerably more attractive to investors. 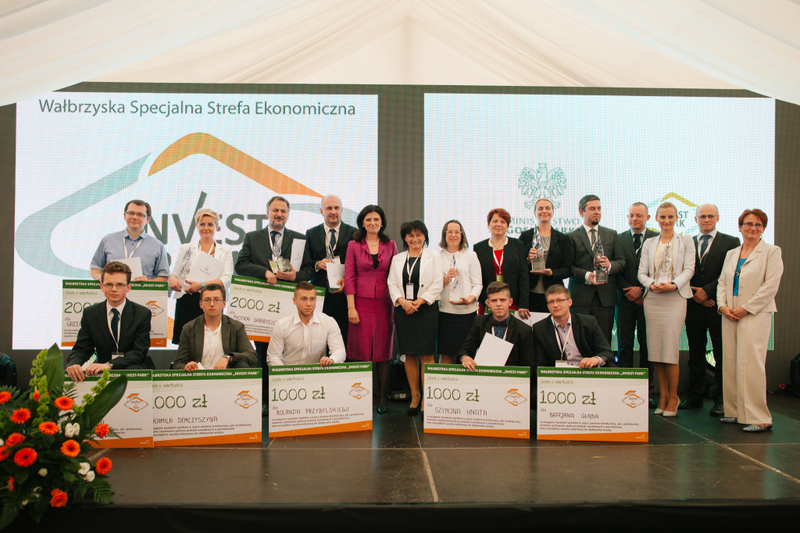 An agreement between the WSEZ “INVEST-PARK” and the gmina of Bolków was signed during the conference. It concerns the development of land along the S3. “We cannot wait until business discovers this road. It is us who must approach companies, show them the gminas and counties the S3 runs through, promote the excellent areas within the economic zones, and prepare the best possible offer for investors by emphasizing the potential of the regions and their inhabitants. I would like to urge in particular small and medium-sized Polish companies to invest here. The Wałbrzych Special Economic Zone “INVEST-PARK” has constructed production floors especially for them. Thus companies can begin activity here without having to invest much capital. The first facilities that were built in Wałbrzych, Bolesławiec, Kłodzko, and Nowa Ruda have already been leased out. But there will be more of them,” declared Mrs. Antoniszyn-Klik.